1. Click here to pro­ceed /?fp=8EX8FoaW­CuxNcq7ggR/0EODR7EVVzp59me036/94.. The web server used by Certifieddocumenttranslation.mobi is run by Confluence Networks and is located in Road Town, Virgin Islands, British. There are many websites run by this web server. The operator uses this server for many hosting clients. In total there are at least 1,166 websites on this server. The language of these websites is mostly english. 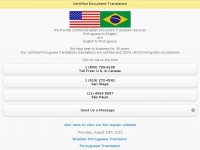 A Apache server hosts the websites of Certifieddocumenttranslation.mobi. Due to the use of frames and framesets the visibility in search engine results may be affected negatively. The website prohibits search engines and webcrawlers archiving the website. Other actions by webcrawlers and bots are allowed.